I’ve started noticing hamentaschen (recipe below!!) showing up in local bakeries, and it made me wonder if one of the reasons we say “Purim Sameach/Happy Purim” is because we know that we’ll be eating lots of hamentaschen, the traditional Eastern-European Purim dessert. This joyous day celebrates the repeal of the death decree against the Jewish inhabitants of ancient Persia (“They tried to kill us, we won, let’s eat!”). In Hebrew, they are called Oznei Haman, meaning “Haman’s ears”. This name may have come from the Midrash which says that when Haman entered the King’s treasury, he was bent over with shame and humiliation (literally with clipped ears). Another folk story is that Haman wore a three-cornered hat, thus its triangular shape. 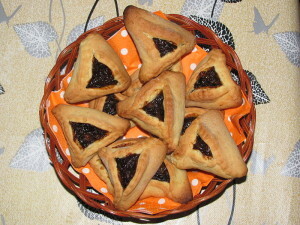 Naked Archaeologist documentarian Simcha Jacobovici has shown the resemblance of hamantaschen to dice from the ancient Babylonian Royal Game of Ur, suggesting that the pastries are meant to symbolize the pyramidal shape of the dice cast by Haman in determining the day of destruction for the Jews. Another big debate about hamentaschen is the type of dough they’re made from; one is thicker and more bread-like, and the other is thinner and more cookie-like. And then, there’s the question of what to fill them with. The original Hamentaschen filling was made with poppy seeds. Others that I grew up with include prune, or a variety of fruit preserves or marmalade, including apricot and raspberry. In doing some research, I found that chocolate filled hamentaschen are popular in Israel! Seems like a tradition we should include here. One of the deeper themes of Purim is that we are told to celebrate the holiday, and make it possible for those less fortunate to also join in the festivities. When we feast or send food packages, are the products we use harming or benefiting the workers? In many situations, those “less fortunate” are the people who grow the food we use to celebrate our holidays. They suffer from market-driven forces that pay them less than the food’s real value; they don’t have access to world markets and get taken advantage of by local distributors or large corporations; and prices on the world market fluctuate, so they can never be sure what price they’ll receive when it’s time to sell a crop. Trading relationships are long term and transparent, allowing producers to reduce costs, gain direct access to credit and international markets, and develop the business capacity necessary to successfully compete. Here’s a link to find Fair Trade Kosher chocolate products. Below is a recipe for Chocolate-Filled Hamentaschen by Ruth Reingold. Enjoy! Melt chocolate in microwave. Add sugar, butter, milk, and vanilla. Stir, and return to microwave very briefly, just to melt butter. Gradually, stir beaten egg into chocolate. Use this filling immediately before it hardens.